Author Ann Brokelman releasing a rescued hawk back into the wild. One day, while driving around the Beach with my birding friend Walter, I saw a huge raptor-looking shape in a tree. 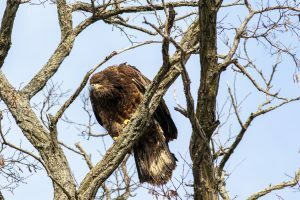 We pulled over as quickly as we could, got closer to the tree and found a juvenile bald eagle. Now, I’ve seen plenty of bald eagles over the years, but to find one hanging out in someone’s front yard was new and exciting. I went to the homeowner’s door to ask if I could take some pictures, which is the responsible and ethical thing to do. He asked if I had found a cardinal or a blue jay. I must have said the longest ‘noooooooooooooo’ in my life as I pointed out the eagle a few metres from where we stood. Within minutes it seemed like he had everyone on the street taking part in this amazing find. If you’re ever in a position to be transporting a wild bird, it’s important to keep them secure in their transportation boxes until the moment just before their release. If a raptor was to get out of its box too early, for example, it could seriously injure itself, let alone anyone nearby! Despite the fact that I know this, mistakes occasionally happen, even to me. One day while taking a red-tailed hawk to be released, I looked in my rear-view mirror to see the hawk’s his head out of his box and looking right at me. I quickly pulled off the road into a cemetery, and my friend Holly and I jumped out of the car. 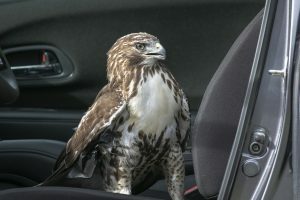 We watched as the red-tailed hawk pushed itself out of the box, hopped onto my seat, and looked around the car. He sat there for a good five minutes while we watched in amazement before he flew out the car door that I had luckily left open. On this day, the wind was intense, though I thought nothing of it before this particular adventure. 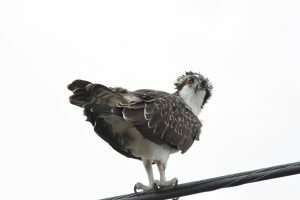 I watched, taking pictures as usual, as an osprey was struggling to stay on a telephone wire. While I watched its feathers blowing, the osprey suddenly pooped. The feces were picked up by the wind and flew passed me, missing me by inches, before I could even think of reacting. This picture has made me laugh every time I see it, knowing that I was inches away from a big mess, and wondering if the look on his face implies he’d be aiming at me the whole time. One summer I was at a park watching three young hawks screaming and running around a lawn. I was sitting down when one of the young hawks jumped up on a nearby bench and just laid down. 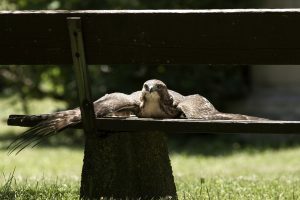 As people were walking through the park they also did a few double takes to make sure they were actually seeing a hawk resting like that on a park bench. It was a fairly hot day and he was looking at me with the expression of a mom or dad who just gave up chasing three little kids around the grocery store. At this moment I felt even more strongly that hawks might be my spirit animal. After a few minutes of enjoying his break in the sun, he jumped on the top of the bench and flew off. I got a call from a neighbour who had noticed a red tailed hawk sitting on a very low branch, which is odd, not moving, which is worrisome. My first thought was that it may have hit the side of their house. I took my trusty net, falconer’s glove, and walked over to the house. Once I approached the bird closer than I would with my camera, and saw that the hawk still wasn’t moving, it confirmed that something was seriously wrong. I was able to get close enough to put the net on him safely and carefully grab his legs. 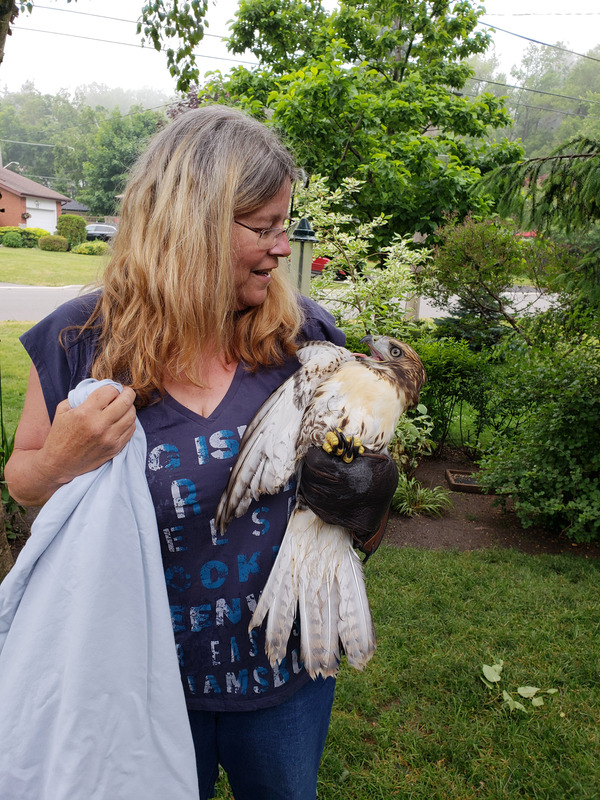 I took him to Shades of Hope wildlife centre and was happy to say that within just 4 days of treatment the young juvenile red tail was released. My husband came with me when it was time to let him go and it’s always extra special when you can be there for both a successful capture and release.